In fact, I made the cake not once, but twice: one for the family celebration (as a trial-run) and then another for the party with school friends. 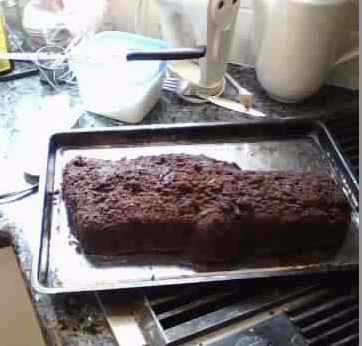 My lumpy-surface cake, after I'd stuck it back together. 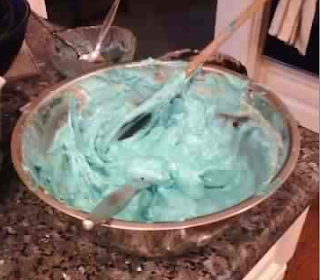 That's a lot of blue icing! 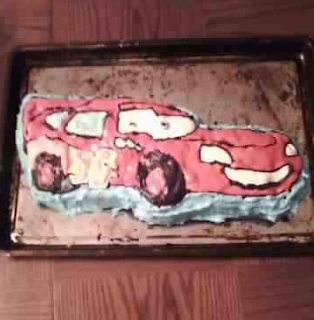 What I was left with was a rather mangled, vaguely car-shaped mass that could only be redeemed by an expert decorating job. Too bad it was just me doing the decorating. 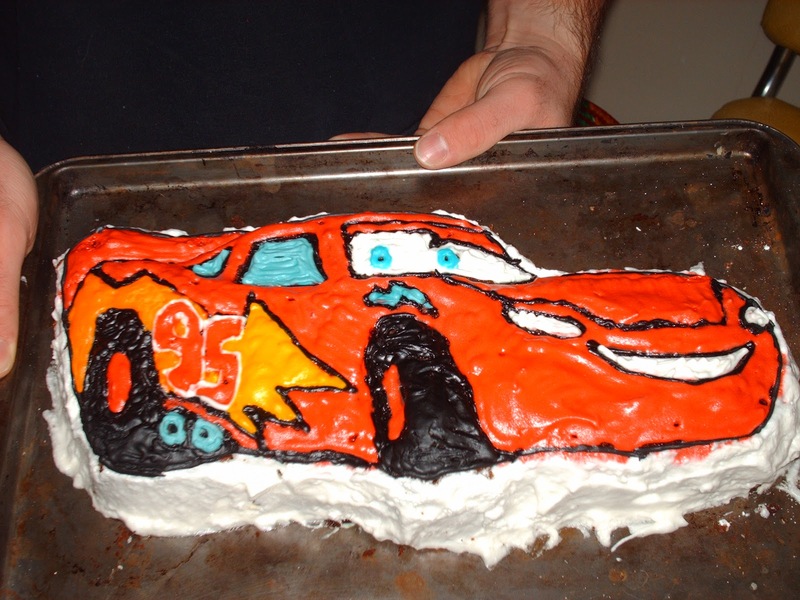 Nevertheless --and despite tinting my entire first batch of icing blue-- I think I managed to pull off something that resembled LMQ, even if he did look oddly lumpy. Feeling confident from my more-or-less success, I looked forward to the second go. I made a different cake recipe and even got it out of the pan intact! Then things started to unravel. I have few clear memories of the day before the party, save that I began to make icing around 10:30 p.m. Did I mention that I made, not one, but two kinds of icing, both of which required somewhat laborious preparation? And did I mention that the design required six colours of icing, in addition to the un-tinted white? A couple of hours later, as I was starting to pipe the outlines, the existential crisis hit. I began to ask myself, "Is this really what I was meant to do with my life? Were all those years of education and skill-building without purpose? How did I get into this mess?" By 3 a.m. the cake was finished. I'm pretty sure I flopped into bed after that. And I must say that the cake looked pretty good! Was it worth it? Hung jury. On the one hand, I did mostly enjoy the project (not the 3 a.m. finish part) and the result was more than acceptable. On the other hand, I think the party guests looked at it for about three seconds before it was cut and distributed. You did an amazing job on this!!! I bet the birthday boy was thrilled. Well done. This is so cool! 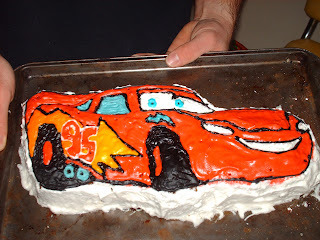 Theo's bday is Thursday next week, we are stuck on a cake...love this idea!